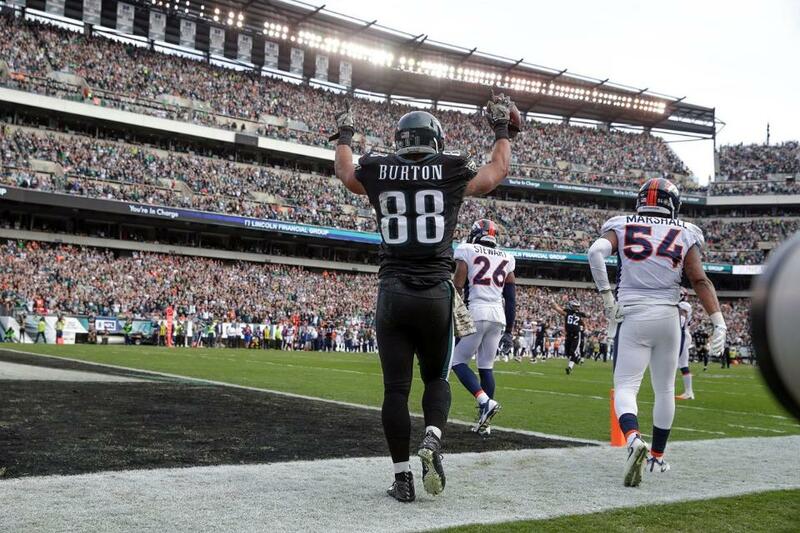 Philadelphia Eagles TE Trey Burton celebrates a TD against the Broncos earlier this season. When I was a young boy, I hated public speaking. It terrified me. Every year, we would have to do a speech in English class and every year, I dreaded the thought of getting up in front of my class and speaking. When I briefly considered a career as a broadcaster, fear of public speaking seemed debilitating. And while God had different plans for me – I didn’t ever become a broadcaster, He did work on my fear by putting me in front of groups of people, often. In fact, after years of teaching Sunday School, speaking at Summer Camps and even leading staff meetings, I find that what used to make me uncomfortable now energizes me. When God challenges our comfort zones, He also shows up to help us. Burton was an undrafted free- agent signed after the 2014 draft after a college career at Florida that saw him play many positions. 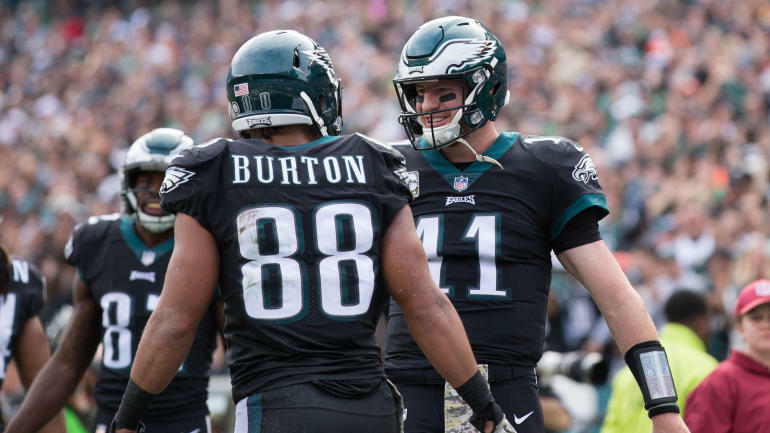 In his first season, he played mostly Special Teams, scoring a touchdown on a blocked punt. His use on offense has grown each season since. He has 2 touchdown receptions already this season. 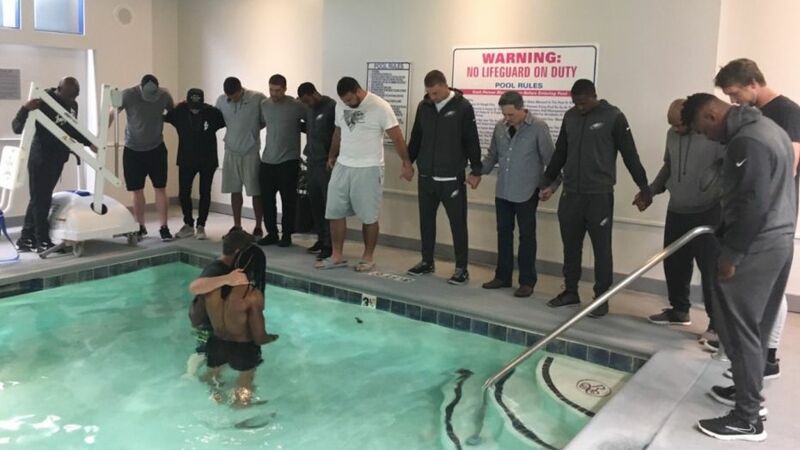 “Pastor” Burton baptizes teammate Marcus Johnson at a Hotel pool in Carolina while teammates pray and celebrate. 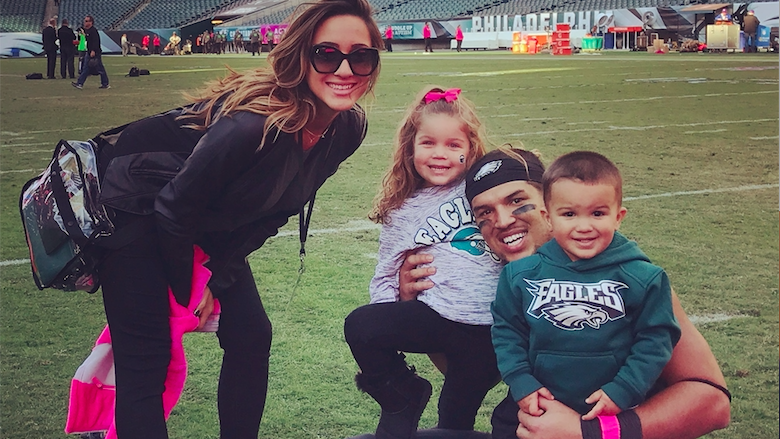 Burton and wife Ysenia know that God’s plans for them go beyond the football field. They want to use their place to share His love with teammates and fans. 1- What can I do? – Often, when faced with the reality of a global issue like human trafficking, we can feel helpless. We find ourselves asking “what can we do?” But that question can be another way too. Not throwing up our hands, defeated saying “What can I do – I’m just one person”. It can also be asked as a call to action – I know the problem exists, and I can’t go back to unknowing it, so what can I do? How can I be part of finding solutions and changing these heartbreaking stories? This issue and question ring close to home for me. My wife is the founder and director of a non-profit that is helping people answer that very question. “What can we do?” Check out Stories Foundation to see what she is doing and what you can do to help out. 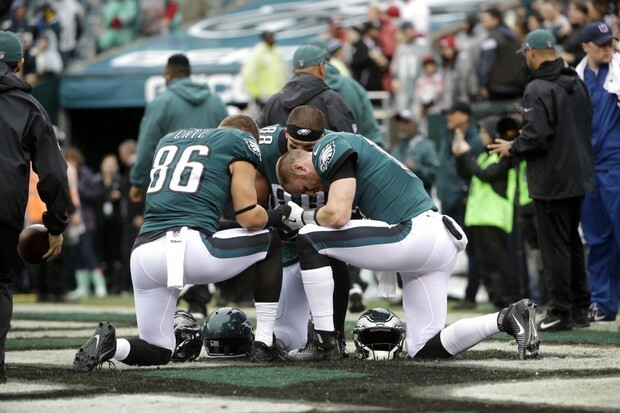 Burton (center) with Tyler Ertz and Carson Wentz pray following a game earlier this season.